The frequency of 747 kHz, on which Radio 5 Nostalgia transmitted until its switch-off on September 1, 2015, has been used by the Netherlands continuously since 1950: 65 years, the age of retirement, one could say. That count does include the time until 1978, when it wasn't 747 but 746 kHz: after the Geneva planning conference of 1975, all mediumwave frequencies were moved to a multiple of 9 kHz. The 746 kHz frequency had been allocated to the Netherlands at the planning conference of 1948 in Copenhagen. Before that, 722 kHz had been used since 1937. On September 1, also the last mediumwave transmitter at Lopik was switched off, on 675 kHz, most recently used by Radio Maria. The history of 674/675 kHz in the Netherlands is a quarter of a century shorter: it had been in use since 1975. 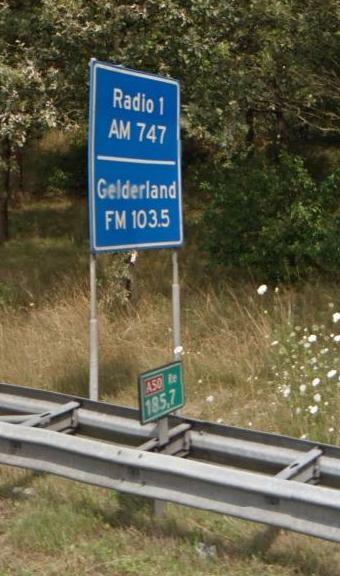 The Lopik site does have a longer history, starting at the end of the 1930s: it was the most important Dutch mediumwave site (for 746 kHz and others) until in 1980 the Flevo site became available; since then, the Lopik site remained as a backup for 747 kHz. We can also look at it from a technical point of view. One reason for the bad sound quality on mediumwave, is that there were way too many transmitters active, which interfered with each other in the evening hours. The last planning conference for long- and mediumwave was in Geneva in 1975. In Europe, about twice as many transmitters were requested as could reasonably be accomodated . Almost all those requests in the end were accepted. Before the conference, there were about 1450 long- and mediumwave transmitters with a total power of 82 MW; according to the conference plan this would rise to 2700 transmitters and 214 MW . And of course the band had not gotten any wider to accomodate this. Looking back, we can note that many of the allocated transmitters have not been realised, at least in part because it was clear that they would be interfered with too much. For example, the Netherlands is allowed to transmit with 500 kW on 171 kHz longwave and 1395 kHz mediumwave, but has never done so. Still, there was much interference, which of course also lead to an inflation of transmit powers, and thus of operating costs, which are now often a reason to switch off a transmitter or reduce its power. Detailed information about LW/MW transmitters in the course of time can be found on ; for the Netherlands, all details are in . An important problem with planning mediumwave stations is that during daytime, only the groundwave works, limiting range to about 100 km, while in the evening the spacewave also works, reaching 1000 km easily. One can see this in the planning of the mediumwave transmitters of France Info (which are scheduled to be switched off at the end of 2015): there are about ten of them, which are needed during daytime to cover all of France with their limited groundwave reach. But in the evening, almost all of them are audible in the Netherlands (give it a try: 603, 711, 1206, 1242, 1377, 1404, 1494, 1557 kHz), so one such a transmitter could suffice to cover all of France. A logical consequence would be to switch off many transmitters at night and give the remaining transmitters each a Europe-wide exclusive frequency (with over 100 mediumwave channels, each country could have several exclusive frequencies), but apparently this was not politically (or technically?) feasible at the time. In America, many mediumwave transmitters are indeed switched off at night. One wonders whether, if in 1975, or a bit later, say in 1990, when FM was much more widespread and the iron curtain had fallen (and with it, the necessity of propaganda), a different plan would have been made, with most stations having an exclusive frequency in the evening, long- and mediumwave broadcasting would have had a different fate. We'll never know. Text and pictures on this page are copyright 2015, P.T. de Boer, pa3fwm@amsat.org .